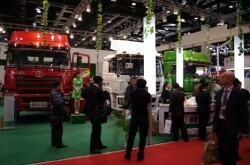 Shaanxi Auto DeLong F3000 LNG trucks on display at ANGVA 2011, Beijing. At the recent 13th China International Natural Gas Vehicles and Gas Station Equipment exhibition held during the 2012 peak NEV (New Energy Vehicles) China forum, lecture participants were briefed on the current development of China’s natural gas vehicles, reports CVWorld. China is responding to upward pressure on oil prices by investing heavily in new transportation fuel technologies, including natural gas. According to the article, from April 2011 to May 2012, natural gas vehicles (NGVs) in China grew by 378,000, with total NGVs amounting to 1.104 million. The NGV population is predominantly powered by compressed natural gas (CNG), at 98.9%, with the balance made up of liquefied natural gas (LNG) vehicles, especially trucks and buses. Indicative of China’s emphasis on diversifying its transportation energy demand and reducing vehicle emissions during this 12th Five Year Development Plan period, 61% of the vehicle growth in the Apr 2011 – May 2012 year reportedly occurred since January this year. The article also points to the maturing natural gas vehicle market, where there has been gradual development of, and major investment in, a more complete supply chain, taking in OEM manufacturing, vehicle conversions, gas supply and other enterprises. In an earlier CVWorld article, the immediate availability and proven technology of natural gas vehicles was recognised as a dominant factor for new energy vehicle sales, particularly for heavy duty vehicles. Party secretary Fang Hongwei reported on market research that showed development and application of HD natural gas trucks is safe and fully meets the needs of market-proven products, for example LNG-fuelled heavy-duty trucks with ranges exceeding 1300 km. Yet another article (Veolia) covers the decision by China’s Guangdong Province to invest more than USD 2 billion to carry out 12 strategic projects on new-energy vehicles and auto parts, some of which will be completed by 2012. Included in the project list is the development of LNG vehicles.